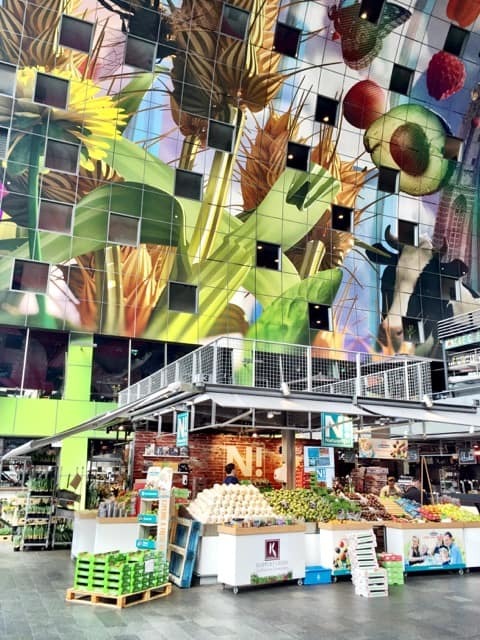 The stunning Markthal in Rotterdam. It all started with a conversation I overheard between two ladies as I walked down a street in Amsterdam. One of them had just spent a weekend in Rotterdam and she remarked how “gezellig” (a typical Dutch word basically meaning cosy) the city had become, the many things to do in Rotterdam and what a lovely time she had. I almost stopped in my tracks when I heard that! Coming from an Amsterdammer, and considering that Amsterdam and Rotterdam are fierce rivals, this verged on blasphemy! Haha! 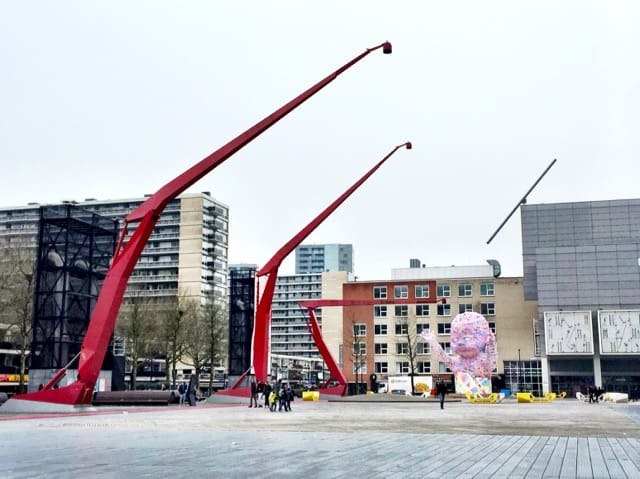 It triggered my curiosity and I made a mental note to spend a weekend in Rotterdam soon. A week later, I found myself in this port city and I couldn’t agree more with that lady! 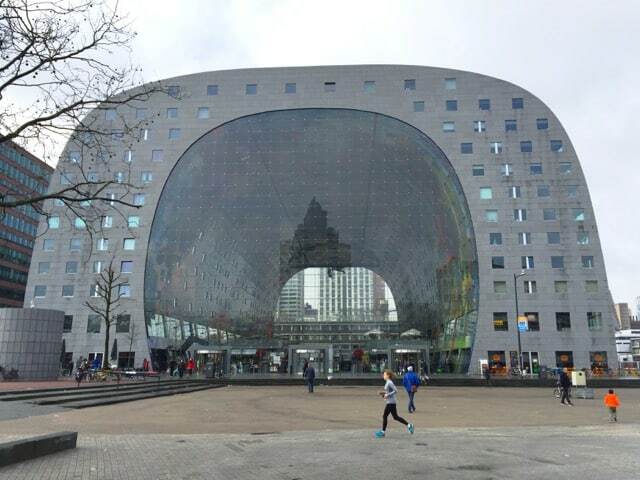 Rotterdam is a bit of an anomaly in the Netherlands. The city proudly holds the title of being one of the largest ports in the world and it’s arguably the only city in the country that oozes a modern flair coupled with an impressive skyline. I never thought much of Rotterdam to be honest; this can be partially attributed to being an Amsterdam snob myself! 😉 Large swathes of the city were destroyed during World War II. The reconstruction that followed was, in my view, more functional than aesthetically-pleasing, resulting in a rather nondescript cityscape – a sharp contrast to Amsterdam, with its charming canals and historic buildings. However, Rotterdam started to experience somewhat of a renaissance from around the turn of the century. New urban projects spearheaded by various world-renowned architects brought new life and a shiny, new skyline to the city. The Erasmus Bridge, nicknamed the Swan, and the skyscrapers in the Kop van Zuid district (background) are symbols of Rotterdam’s renaissance. One thing I quickly noticed was the large number of intriguing art installations in the city, such as this colourful tower. 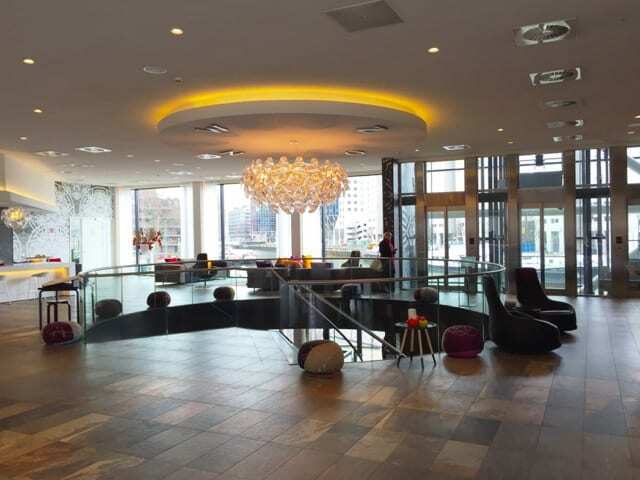 I chose the Mainport Hotel, a five-star waterfront hotel in the city centre as my weekend base. 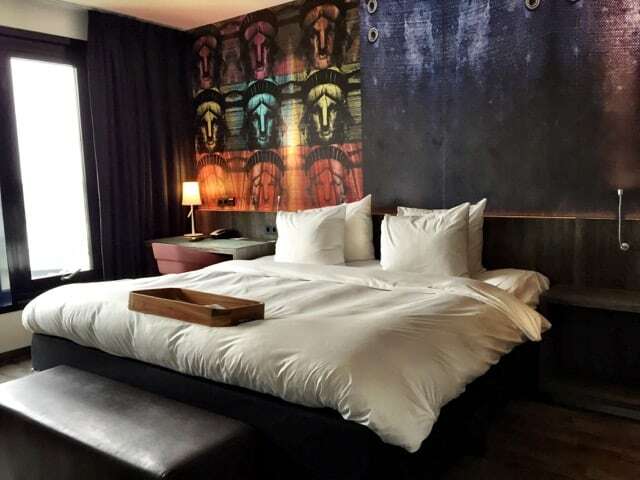 The hotel is perfectly situated between the harbour and the Coolsingel, the city’s main thoroughfare, and a stone’s throw from the city’s main attractions and the lively Witte de With quarter. The lobby of the Mainport Hotel. I booked a harbourview room with a spa – some rooms come equipped with both a Finnish spa and a jacuzzi with a view of the harbour! My room had a gorgeous view of the Leuvenhaven and the city’s iconic Erasmus bridge. My room at the Mainport Hotel. From the hotel’s doorstep, I hopped onto a tram which took me to the Central Station in ten minutes. 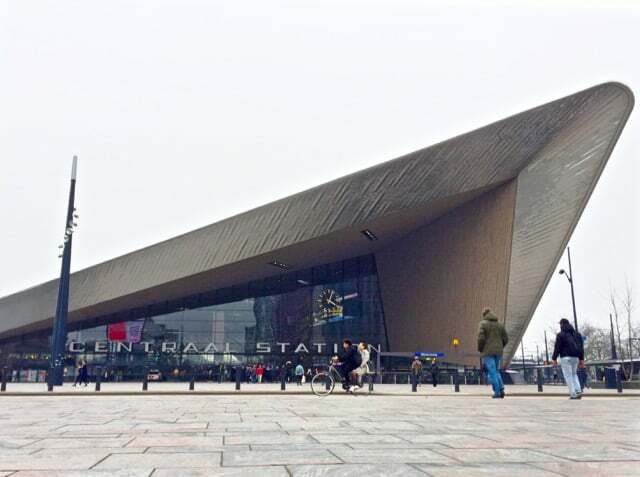 This new railway station, with its pointy roof, is absolutely spectacular. Shiny skyscrapers next to the Central Station. … and the Schouwburgplein (Theater Square). 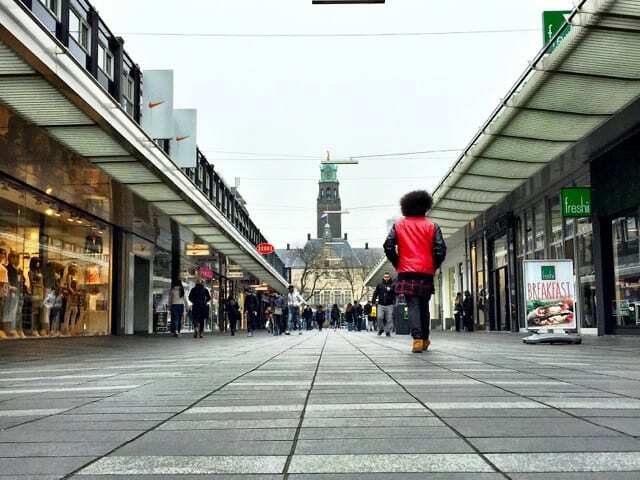 I walked down the Lijnbaan, the city’s main pedestrian-only shopping street towards the Coolsingel street where the City Hall is located. From the Coolsingel, I walked to the Witte de With Quarter, with its many cafés, terraces, bars and restaurants. There’s also some great street art in the Witte de With Quarter and the surrounding streets. That evening, I had dinner at the L’Entrecote restaurant located opposite the famous Museum Boijmans Van Beuningen. L’Entrecote specialises in… you guessed it… entrecotes! And it’s sublime! Tender, juicy and served with a crunchy salad, excellent fries and a tasty sauce. And if you’re looking for a Chinese fine-dining experience, check out Asian Glories. The Peking duck at Asian Glories is superb! The next day, after a terrific breakfast at the hotel, I visited the Maritime Museum which is practically next door to the hotel. 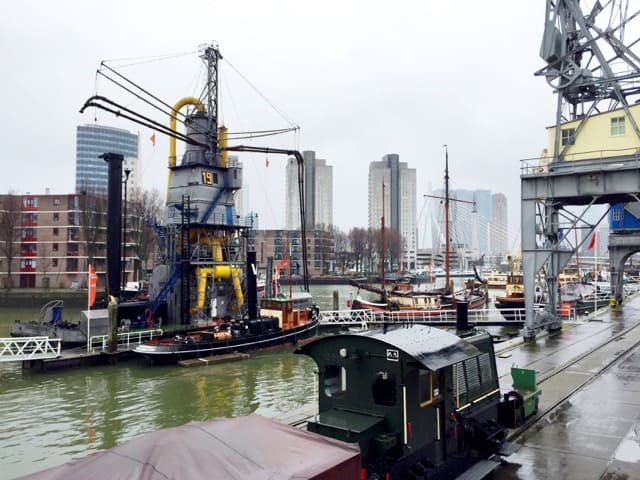 The Maritime Museum is great for people of all ages and provides unique insights to Rotterdam’s maritime history. From the Maritime Museum, I walked towards my next stop, the Markthal. 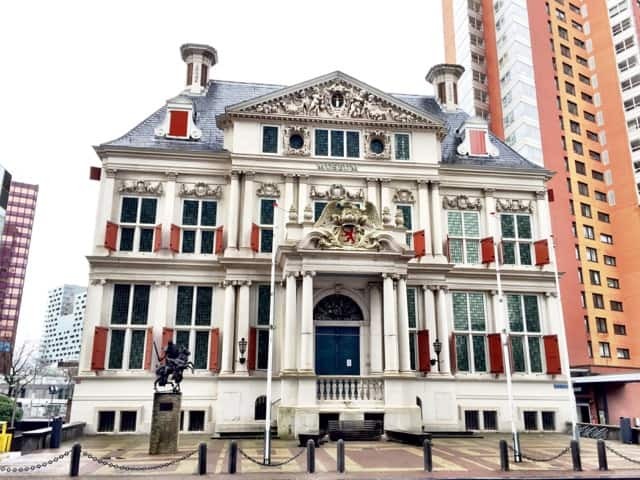 Along the way, I passed by the Schielandshuis, the only remaining 17th century building in the Rotterdam city centre. 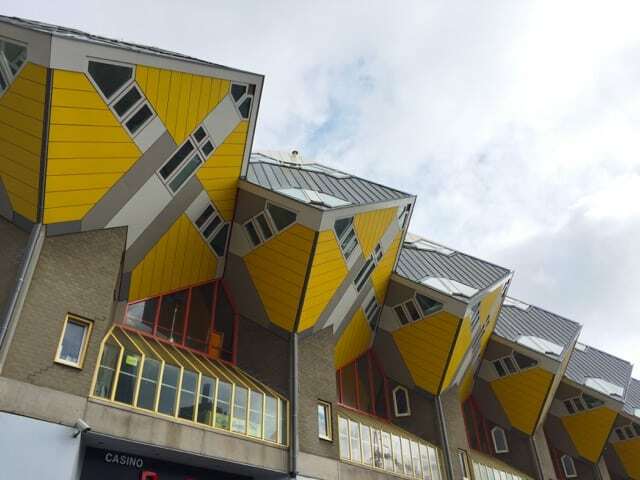 Opposite the Markthal, you’ll see these curious-looking cube houses, which are a Rotterdam icon. 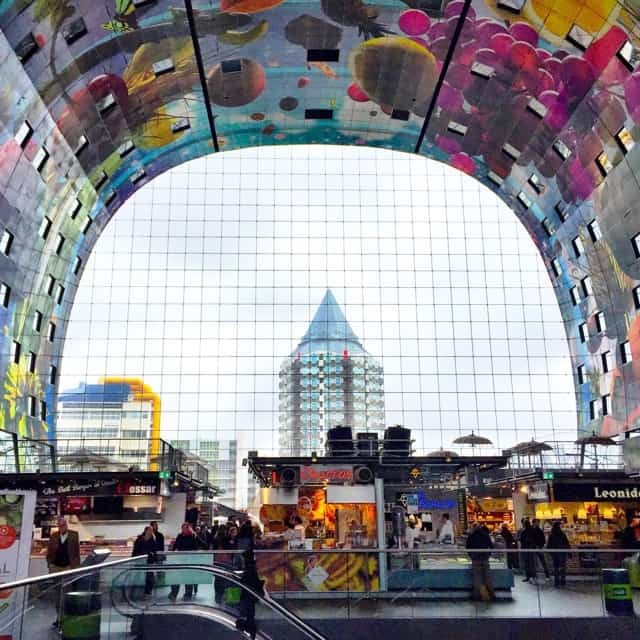 I finally arrived at the Markthal, just in time before it started raining! I was very excited because I’d seen so many amazing photos of this new market. The interior of the Markthal (or Market Hall) is, with its colourful ceiling, indeed stunning! I couldn’t take my eyes off that amazing ceiling! There are many stalls selling a variety of fruits, vegetables, meats, fish and other ingredients. 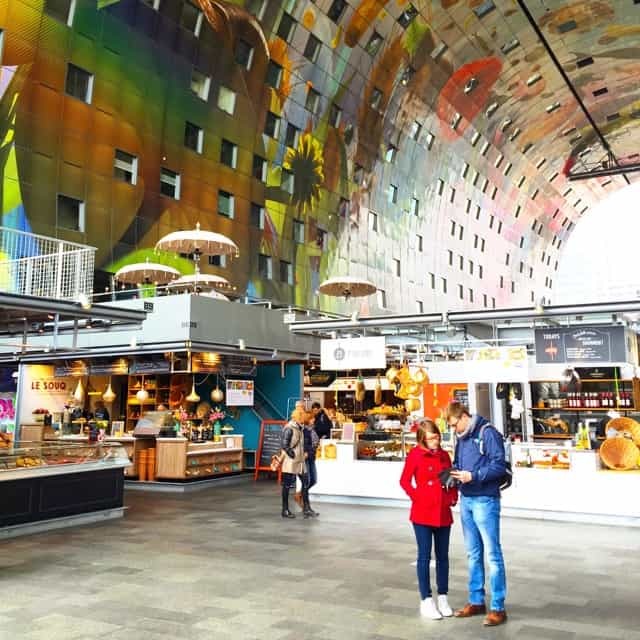 The Markthal is real foodie paradise where you can sit and enjoy cuisines from around the world, from Japanese to Moroccan, and Chinese to Spanish. There are also various restaurants, cafés and bars. 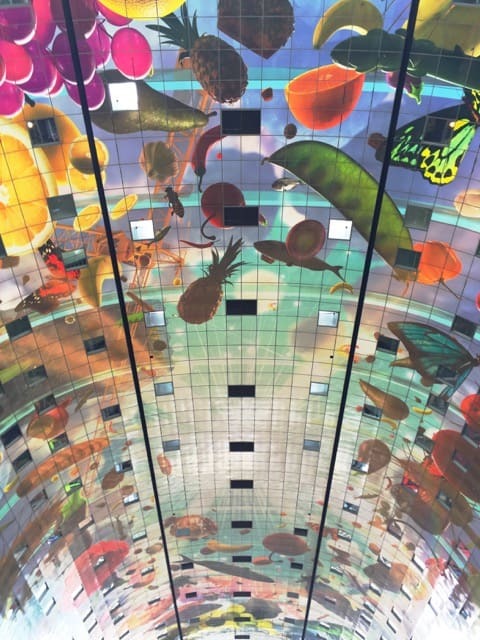 The ceiling of the Markthal with its vivid illustrations of fruits, vegetables, animals and flowers. Fruit stalls with that ceiling as an astonishing backdrop! If you love spices, drop by this stall. 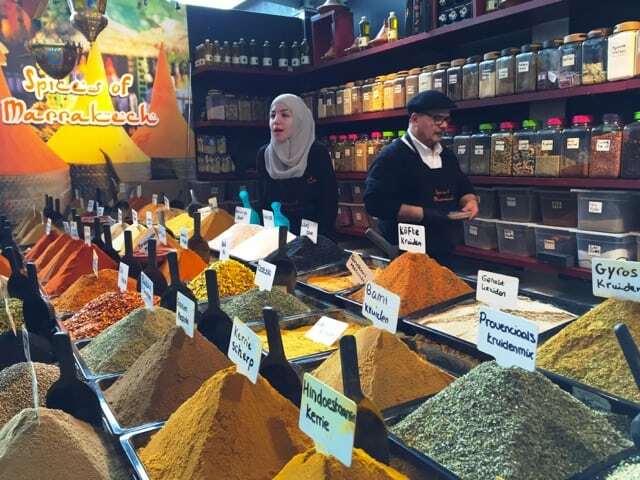 I bought loads of different spices here! I only scraped the surface of Rotterdam on this 36-hour visit. This vibrant city has much more to offer visitors. 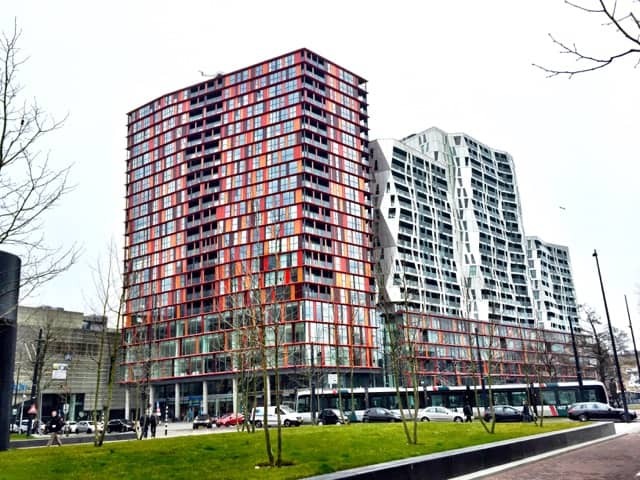 visit the historic and modern landmarks in the ‘Kop van Zuid’ district just across the Erasmus bridge. 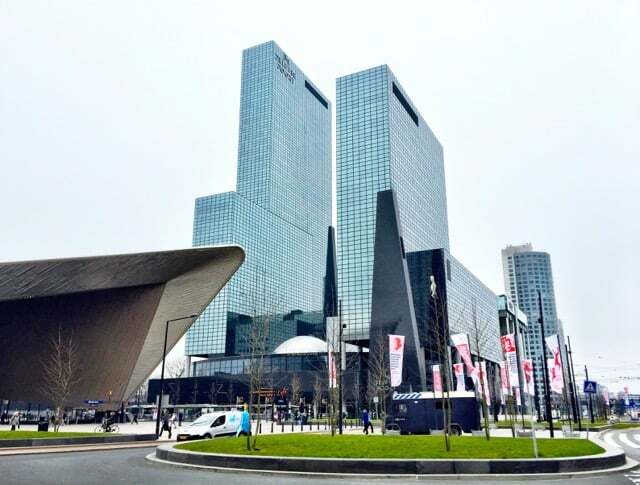 My favourite is De Rotterdam, a striking 3-in-1 tower designed by world-renowned Dutch architect Rem Koolhaas. You can also opt for a two-hour architecture walking tour. 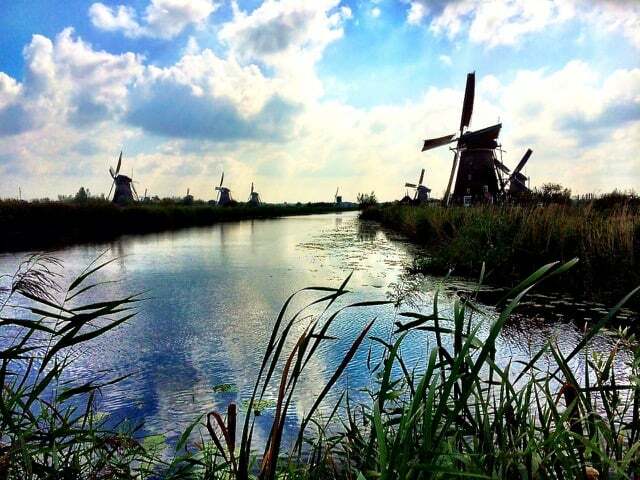 embark on a three-hour river cruise to another UNESCO World Heritage site: Kinderdijk. This site, with its 19 18th-century windmills, is famous the world over. The historic windmills of Kinderdijk. Visit Rotterdam Info for more information and tips for things to do and see in Rotterdam. Search for hotels in Rotterdam (Booking.com). Great post. Rotterdam always gets a bit of stick in that it’s not pretty and not gezellig. But I too discovered how cool it is not long ago. I really loved it. I know what you mean. Hehe! That’s why I was so impressed this time! 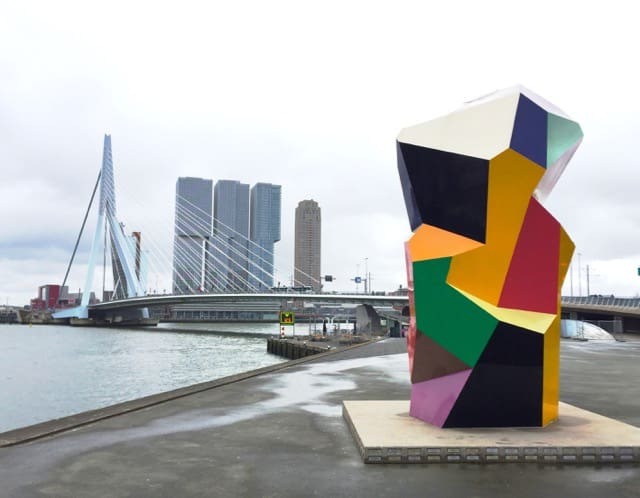 Rotterdam is indeed a fab city for fans of art, architecture and design. 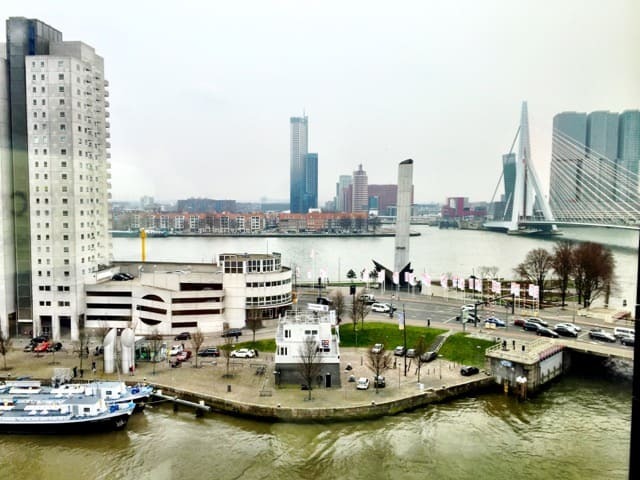 I visited Rotterdam in 2010 when I worked in academia and was invited there for a conference. I didn’t really like it – but I admit that I didn’t spend too much time exploring. Thanks for showing me another side to the city. I am intrigued to go again now!